The Final project we submitted in the Hospitality / Public Space Category is the Bill Snyder Family Stadium, End Zone at K-State. 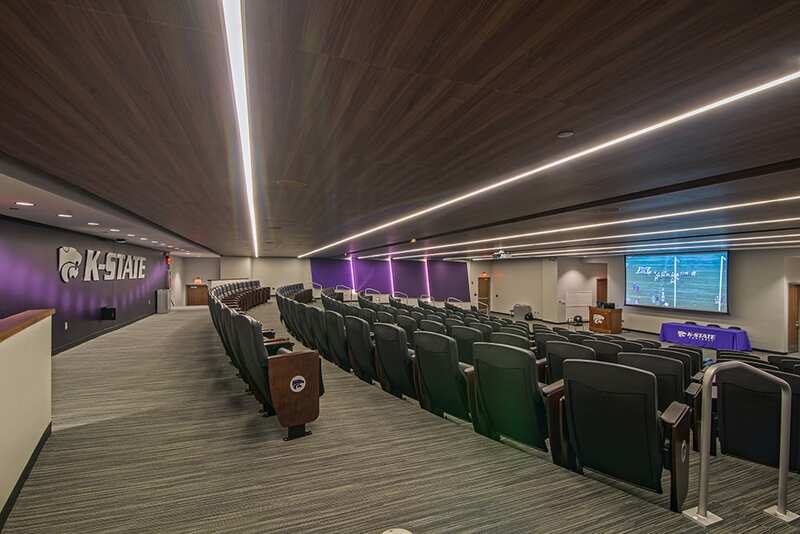 This is the second project we completed for K-State at the stadium, and we plan to be a part of the remaining updates to the facility. Kansas State Football Coach Bill Snyder, who took the worst team in college football and created a winning team, emphasizes that success is developed by 16 goals of equal value, all which require commitment. 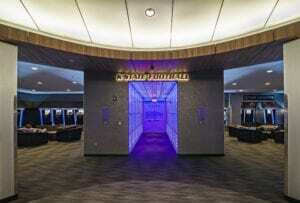 This new stadium and training facility is centered on these goals and Bill Snyder’s vision to create the perfect team. Building off of his vision, designers for this classic athletic facility had to develop a space suitable for recruitment and development of elite athletes. The gothic limestone exterior attracts students with a powerful feel of traditional campus architecture. Once across the threshold, students are greeted with a modern energy that is evident through illumination and transparency. Technology, design, and first class amenities encourage athletes to achieve their goals. To soften the contemporary design features, carpeting was selected to accent the royal purple interior finishes, creating a feeling of warmth and depth. To further accentuate the expansive open spaces in the locker area, carpet with an organic large-scale pattern was used to create a contemporary feel. In the corridors, patterns were installed directionally helping to break up the long hallways. Providing a modern twist to what could have been a generic meeting space, luxurious royal purple carpet wrapped the floors of the executive conference room. Coach Snyder’s dream, paired with the commitment and great effort this design team demonstrated, resulted in the creation of a world class athletic facility where students and community could unite.